An image reject mixer is a special mixer that will perform a single sided up or downconversion. In a single sided upconversion, one of the the sidebands (LO+RF or LO-RF) is suppressed by the mixer, whereas in a single sideband downconversion (or ‘image reject’ conversion), one of the sidebands is suppressed out of the IF port. 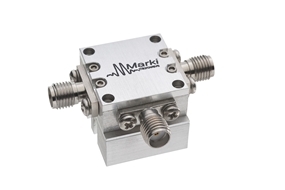 Marki IR and SSB mixers offer excellent image suppression and sideband rejection across broad bandwidths.